The Roman Empire's hold on its outlying provinces has become tenuous. Christianity is on the rise in Alexandria, with militants threatening the remaining population of Jews and Classically-inspired pantheists. 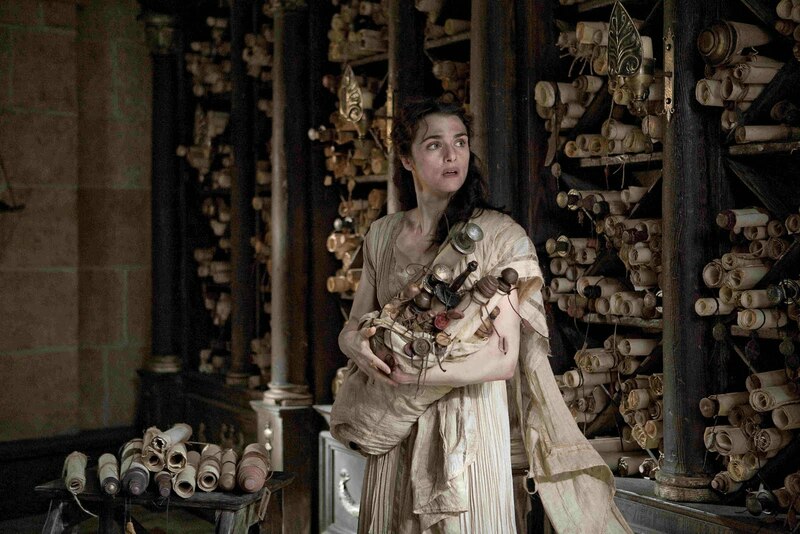 The Library is at the heart of this maelstrom, with Hypatia its most notable resident scholar. She refuses to bow to the new order. You just can't keep some people out of the library. Libraries at the Movies gets many hits from people searching Google about Rachel Weisz's performance in The Mummy: my post about this film is the second most popular page. People (anecdotally, many of them librarians) like the intelligence and crypto-sexiness she brings to the role of dusty librarian-adventuress Evelyn "Evy" Carnahan. When Weisz returned to play Carnahan in The Mummy Returns, her character had devolved from an intellectual, if doe-eyed, love-interest into a wife, a mother, and a re-incarnated princess all in one, hardly a symbol of twenty-first century womanhood. By the time of the franchise's third outing (The Mummy: Tomb of the Dragon Emperor (aka The Mummy 3: Gratuitous Attempt at Making Money in China)) Weisz had had enough. She announced that she was unable to reprise the role due to birth of her son. The Hollywood rumour-mill suggested an alternative story - Weisz was angered at the shallowness of the role, at being asked to play mother to an actor only eleven years her junior, and was concerned about the quality of the script. Yet her career choices since turning down this (presumably lucrative) paycheck have hardly inspired confidence in her artistic sensibilities. I knew I should have used Dewey Decimal! By a quirk of coincidence, in her best performance since retiring from being chased by mummies, she played another librarian working in Egypt, and a radically feminist one at that. This is not the space to rehearse the maze of pseudo-history surrounding the Library of Alexandria, but according to some accounts Hypatia was its last director. Agora draws upon this nugget of speculative history, popularized most famously in Edward Gibbon's Decline and Fall of the Roman Empire, though by the time she inherits the top job the torch-wielding barbarians are already (literally) at the Library's gates. For the first half of the film Hypatia is presented as a combination of Athena, Aristotle, Oxbridge tutor and Vestal Virgin, who teaches the liberal arts to a class of adoring young men, promoting liberality and the scientific method in a town increasingly crumbling towards doctrinalism and miraculism. 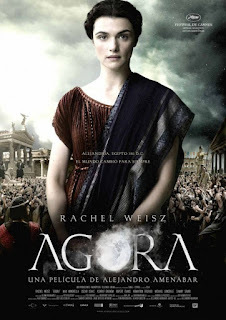 Though it broke box-office records in Spain (home of its producers, director, and writers), Agora struggled to find distributors elsewhere - it has been widely accused of an anti-Christian bias. But though the Library is burned by a Christian mob, this is an over-simple interpretation of a complex film. Christians, Jews, Romans, Hellenistic pantheists and Hypatia's own secular worldview are all subjected to criticism. Most of the characters are eventually poisoned by prejudice and a cowardliness that puts supposed duty to a higher power before love, friendship and honesty. Agora confuses more than it satisfies. Its ambition is unrealized. As George Lucas (who also drew heavily on Gibbon), demonstrated in Star Wars, times and places alien to our experience are brought into reality by focusing on scruffy detail - panning across computer-generated cities is not enough to evoke a lost or future world. And though I know something about this telling of history, I was still confounded by the details of the internecine strife. The modernist architects believed that 'God is in the detail.' Here, all details of history's most famous library building are glossed over, and shelves of scrolls are meant to provide us with enough to be able to fill in the detail ourselves. They can't. But the Library does provide the location for the film's exquisite ending, a scene of betrayal, tragedy and adoration, full of Steinbeck-like sadness.